A Press Briefing meeting is organised to share the Legal Opinion delivered by Judges of Monsanto Tribunal. 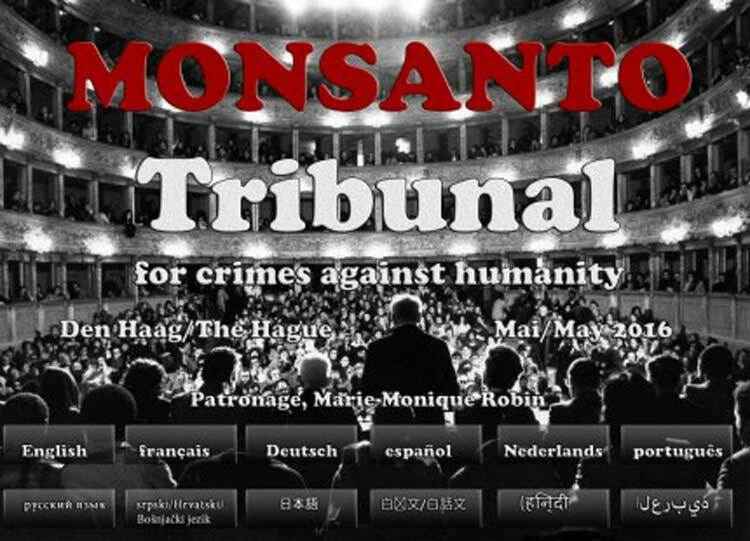 The Monsanto Tribunal, an international civil society initiative to hold Monsanto accountable for human rights violations, for crimes against humanity, and for ecocide was held in the Hague, Netherlands during 15 - 16 October, 2016. Eminent judges heard over 30 witnesses, lawyers and experts. In April 2017, the Judges publicly delivered a legal opinion following procedures of the International Court of Justice. A distinct and parallel event, the People's Assembly, was a gathering of social movements from all over the world that exchanged ideas and planned for the future we want. The witnesses from US, Latin America, Europe, Africa, Australia and Asia testified how Monsanto has violated human rights and has committed crimes against the planet by aggressively promoting its products, lobbying politicians and attacking independent scientists. The Monsanto Tribunal confirmed how poisonous products and toxic chemicals such as Round Up (Glyphosate) & Basta (Glufosinate), neonicotinoids, atrazine, and other pesticides have led to the destruction of soils, to desertification, to the extermination of bees, to the rise in health epidemics such as cancer, birth defects, and respiratory disease. Specific cases of Bt Cotton in Africa and India were presented. A testimony was also presented from Bangladesh on Bt Brinjal issue. Based on these testimonies, and considering both existing international law and on going legal initiatives aiming to improve the protection of human rights and the environment, the judges concluded that Monsanto has indeed infringed on the public’s rights to food, health, a healthy environment and the freedom indispensable for independent scientific research. The Tribunal is also of the opinion that “international law should now precisely and clearly assert the protection of the environment and the crime of ecocide”. If such a crime of ecocide would be recognized in international criminal law, “the activities of Monsanto could possibly constitute a crime of ecocide”, the judges stated. The legal opinion of the Monsanto Tribunal is a moral resolution and confirms the need to assert the primacy of international human and environmental rights law in the international legal framework. International law should now precisely and clearly assert the protection of the environment and the crime of ecocide. The Tribunal concludes that if such a crime of Ecocide were recognized in international criminal law, the activities of Monsanto could possibly constitute a crime of ecocide. Civil society movements now have a new instrument and an eminent legal advisory opinion to enforce their actions to defend the rights of the Earth and of people.